„Ecotainment“. 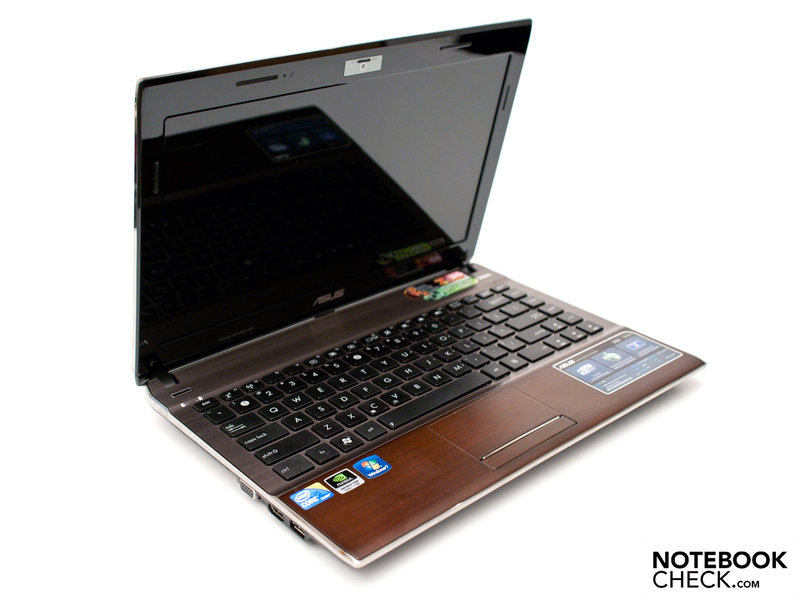 The Asus U33JC from the "Bamboo Collection" attempts to straddle both multimedia performance and environmental friendliness paired with a longer battery life. Will it manage to succeed or is the netbook just a nice lifestyle accessory in 13.3 inches? 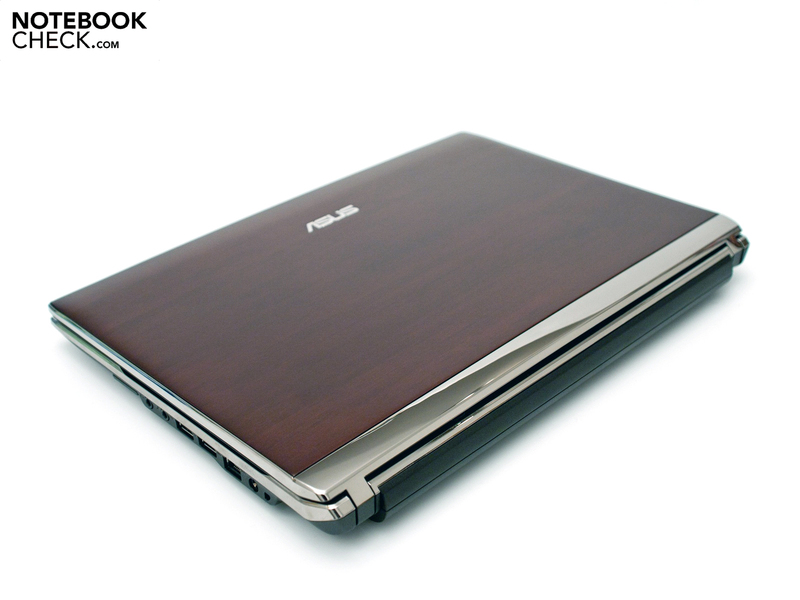 With the U series "Bamboo Collection", Asus launches new notebooks onto the market that are aimed at environmentally concerned users. 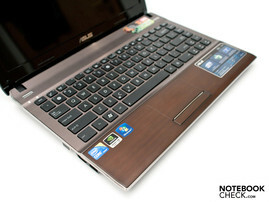 However, since they shouldn't have to forgo on computing performance and comfort, Asus tries to find a green balance. Asus currently offers two alternatives in its Bamboo range: The U53JC with a 15.6 inch display and the U33JC-RX044V with a 13.3 inch screen and a big 8 cell battery, which we reviewed. 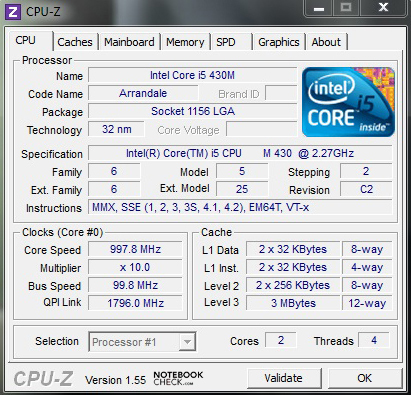 The latest Intel Core i5-430M with 2.26 GHz, and which is supported by two graphics units, works inside. Either the Intel GMA or the dedicated Nvidia GeForce 310M are activated via Nvidia's Optimus graphics switching during use and depending on the demand. Thus, the maximum battery life or performance is made available and, above that, energy is to be saved even in mains operation. Aside from case parts made of bamboo (display lid and wrist-rest), the U33JC-RX044 bids other features that shouldn't be ignored. Amongst these, a USB 3.0 port, a SRS Premium Sound and Asus' Super Hybrid Engine, especially useful in energy savings mode. A hard disk with a memory capacity of 500 GB, a 4 GB of DDR3 100600S RAM, Windows 7 Home Premium (64 bit) and a glossy 13.3 inch display with a native resolution of 1366x768 pixels also belong to our test device's equipment. 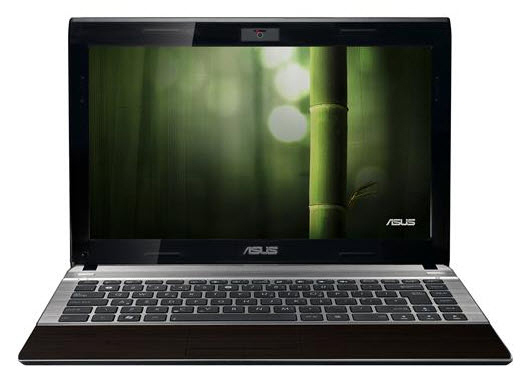 The Asus U33JC-RX044V from the U series, "Bamboo Collection" is now available for 999 euro including added value tax. The UJ33JC's exterior impresses with understatement. The case's black plastic bottom paired with bamboo surfaces and brushed aluminum looks plain, but elegant and high-end. Two bars in a chrome look finish of the overall appearance. However these and the display bezel attract fingerprints magically. 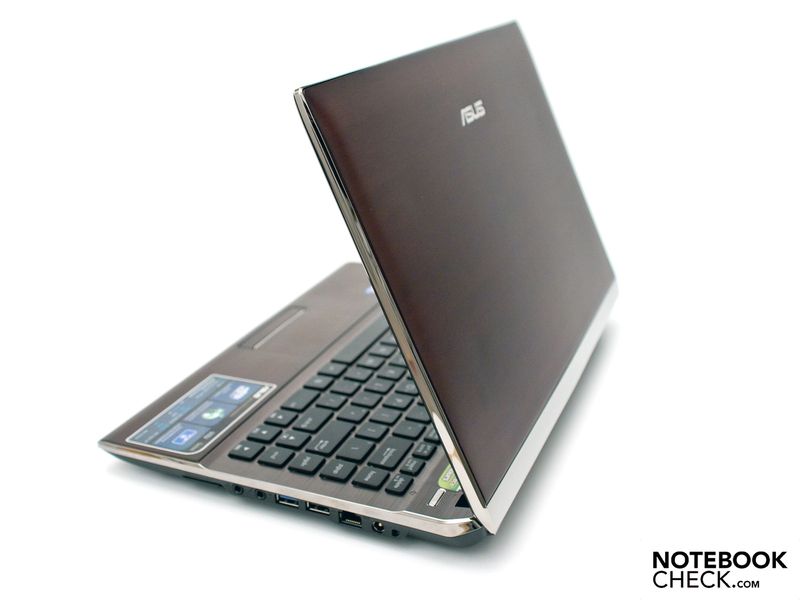 Asus also only has the notebook in this configuration. The bamboo and aluminum parts' haptics are very pleasant. The bamboo fibers' structure in the area of the wrist-rest also bids a special feel. The touchpad incorporated in the wrist-rest is interesting. It is also made with the dark brown bamboo surface and is only separated by a narrow border. The case's stability is overall convincing. It even stands up to strong pressure on single case parts and only yields slightly. The display bezel is fairly rigid. The bamboo notebook weighs 2.08 kilograms at a size of 32.8 x 23.2 x 1.48 – 31.1 centimeters. The big and comparatively heavy 8 cell battery is included in this measurement. The AC adapter's weight of 215 grams is within the limits for a device with a 13.3 inch display. The connectivity is as extensive as usual for a multimedia notebook. Beside the large vent, a VGA put for older monitors or a laptop projector, a modern HDMI port for audio and sound transmission in high quality and a USB 2.0 port for peripherals is found on the left. The case's right accommodates the majority of the supplied interfaces. These are a 5-in-1 cardreader that can read and write SD, MMC, MS, MS Pro and xD memory cards, the usual audio sockets (headphone out, microphone in), a RJ-45 network socket, the power socket for the included adapter and a Kensington Lock for securing the notebook. Additionally, a fast USB 3.0 port is given as a special treat. The front and rear are free of any interfaces. On the whole, the circumference is quite vast, whereas an ExpressCard slot and an optical drive aren't included. 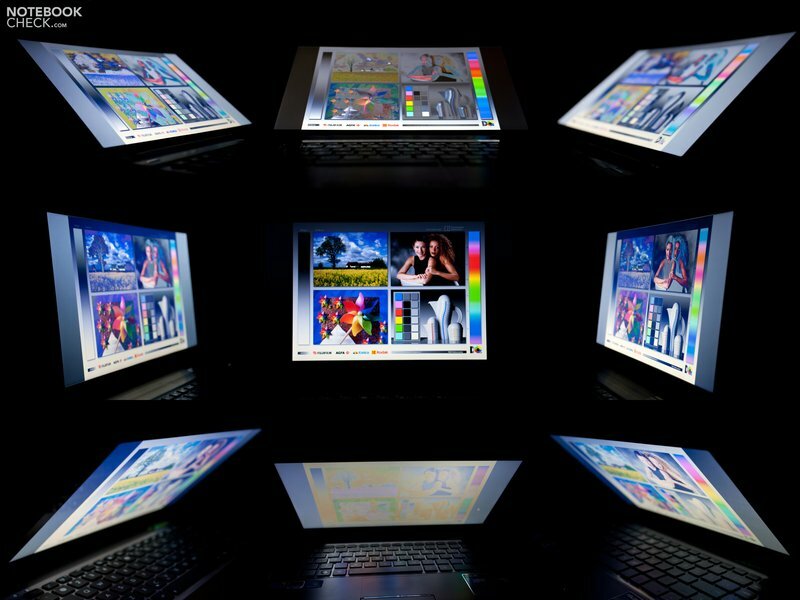 The USB 3.0 port and the HDMI out, which is more and more developing to a standard in modern multimedia notebooks, are delighting. The positioning of each port is favorable. Merely the two closely placed USB ports on the right could cause problems. 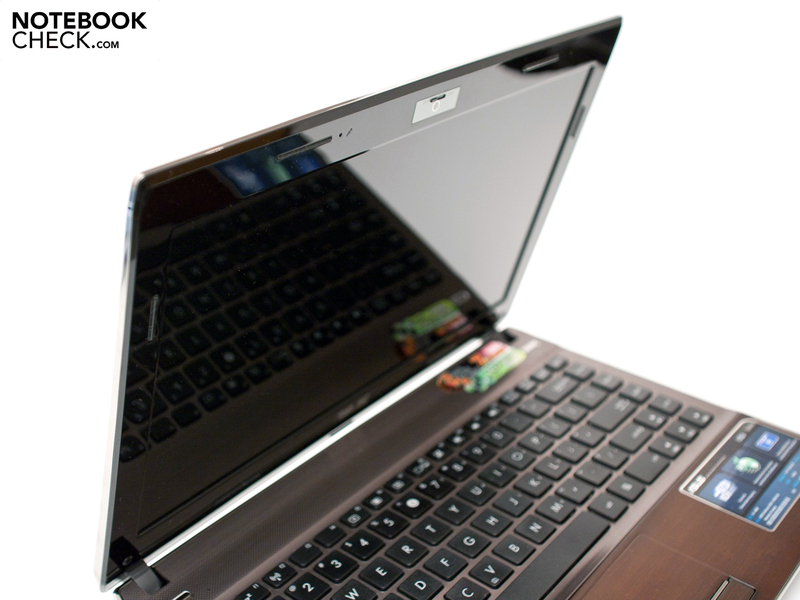 The notebook's communication options comply with the current standards of technology. Aside Gigabit Ethernet (Atheros AR8131) you also get a fast WLAN, standard 802.11 b/g/n, and the somewhat out-dated Bluetooth 2.0 standard. The latest Bluetooth 3.0 controller and a UMTS module are currently not available by Asus. It looks rather meager in the generous, environmental-friendly bamboo pulp packaging. You'll find the according adapter with an European power cable, a large 8 cell battery with a capacity of 84 watt hours, a Velcro cable strap for the adapter's cable, a cleaning cloth and manuals as well as a DVD beside the notebook. Until now, optional supplies especially tailored for the U33 aren't available. The keyboard is also suitable for prolific typists due to the generous keys. The American keyboard layout of our test device is striking. It provided a bit of insecurity in the beginning. It will naturally be available in stores with the QWERTZ layout in German-speaking countries. The key size of 15x15 millimeters is sufficient and even large fingers find their way around quickly. The pressure point is clearly felt. However, the small enter key strikes in this construction size. Overall, the US layout makes a clearly arranged and tidy impression. The V7.0 touchpad from Synaptics has a very pleasant haptic due to the bamboo texture. The feasible diagonal of 8.7 centimeters is quite generous. The thin border from the wrist-rest is pleasing. The touchpad has a horizontal and vertical scroll bar, which aren't marked though. We regrettably had to live without the latest multi-touch gestures in our test device. 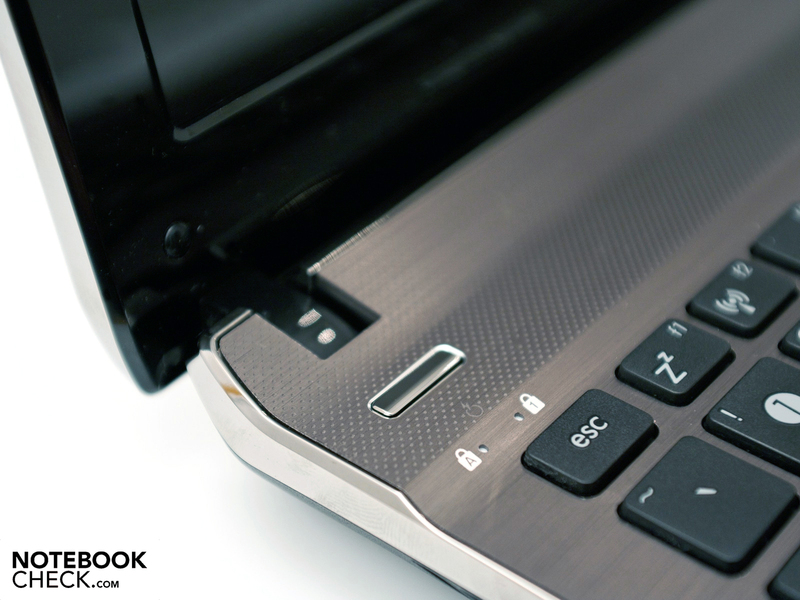 The touchpad buttons are located directly below the touchpad and separated by a silvery bar. The pressure point and stroke length are crisp and the key noise is hardly audible. Two separate keys would have added to ergonomics. Asus uses a non-AR coated display (type: AUO102C) that has a native resolution of 1366x768 pixels at a size of 13.3 inches. The given LED backlight allows the display surface to be illuminated brightly and evenly. The maximum brightness of 209 cd/m2 and the average (194.7 cd/m2) are in the broad midrange. 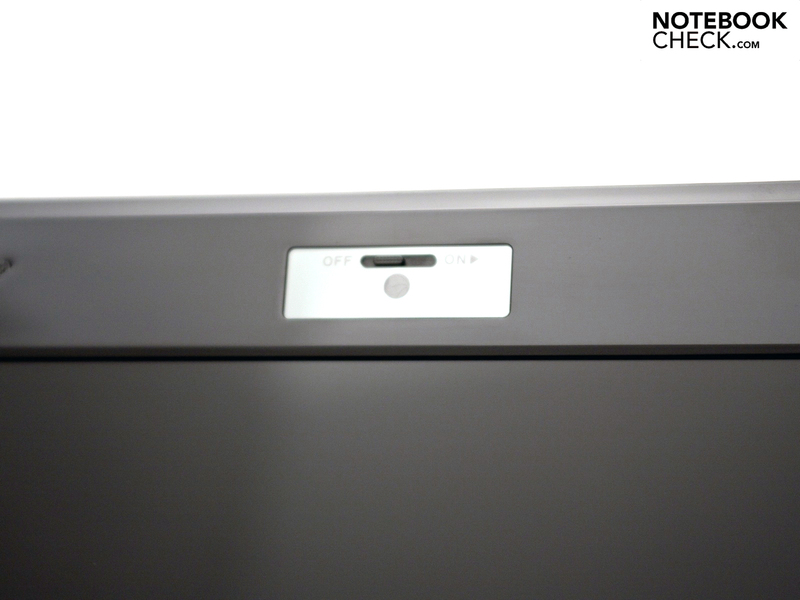 The combination of high-gloss surface and moderate brightness rates could cause problems in outdoor use, though. The illumination with a total of 81 percent and the elevated black value (1.24 cd/m2) are rather average. The black value causes a low contrast of 160:1, beside a grayish black representation. The color representation and focus seem alright and don't give reason for complaint. The color assessment with the X-Rite i2Display 2 tool place the screen in the broad midrange. The MacBook with a 13 inch screen is located in a similar price category, but the representable color spectrum is considerably larger. Thus,the U33JC is rather unsuitable for professional users. Outdoor use is very restricted due to the moderate rates and the display's high-gloss surface. Direct light incidence creates an obvious mirroring of the surroundings and the content becomes illegible. Working in the shade or inside rooms is possible with loss of comfort. Reflections can still turn up, but the content is displayed adequately. The viewing angle stability is only convincing on the horizontal plane. The image stays stable up to about 160 degrees. Thus, watching movies or looking at pictures is fun even with several people. Vertical movements cause problems because the impression of a negative quickly develops. Asus relies on tried and tested hardware from Intel and Nvidia. The heart is an Intel Core i5-430M processor with a clock rate of 2.26 GHz. 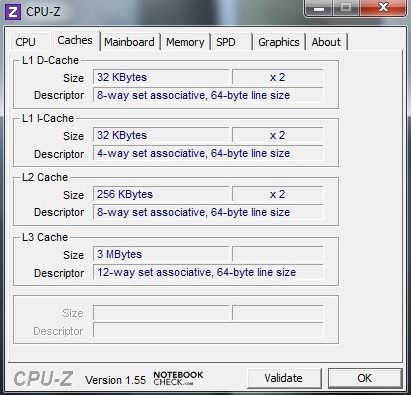 It can be increased to 2.53 GHz via Turbo Boost when required. This processor has two physical cores (4 threads) at a structure width of 32 nanometers. Aside the processor's incorporated Intel GMA HD graphics chip a dedicated graphics unit for simple multimedia use is employed in form of Nvidia's GeForce 310M. It has a better performance than the processor's graphics with a core rate of 625 MHz and maximum of 512 MBs. Due to Nvidia's Optimus (automatic graphics switching), the system selects the adequate GPU unit, depending on the requirements. An obsolete Nvidia driver (8.16.11.8964) was installed in our test device. However, an update to the latest driver version, 258.96, is not recommendable. A short time after its installation, system crashes and image hangs occurred. Thus, we were forced to reinstall the old driver in Windows 7's secured mode. Nevertheless, an update is very necessary because a few functions and the automatic Optimus switching don't work properly with the old driver. Besides the processor and graphics units, a 2.5 inch Western Digital hard disk with a gross capacity of 500 GBs and a 4GB DDR3 10600S RAM is found inside. 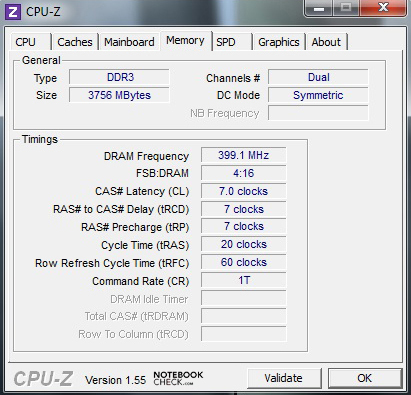 However, the latter only works with 1066 GHz instead of the possible 1333 MHz. Interestingly, there are two RAM modules from two different manufacturers found underneath the large maintenance cover on the bottom. 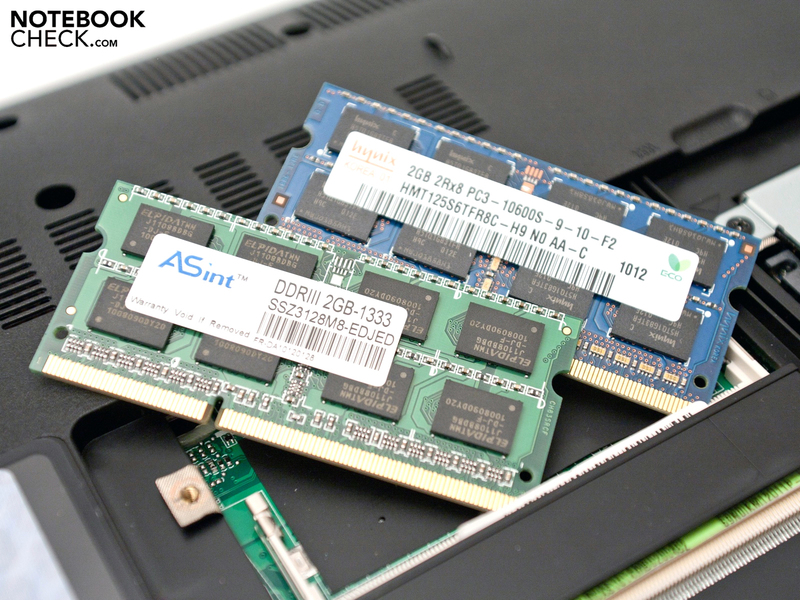 The extendability can be overall rated as "good", since both the RAM as well as the hard disk can be replaced. The CPU and application benchmarks leave a good impression. 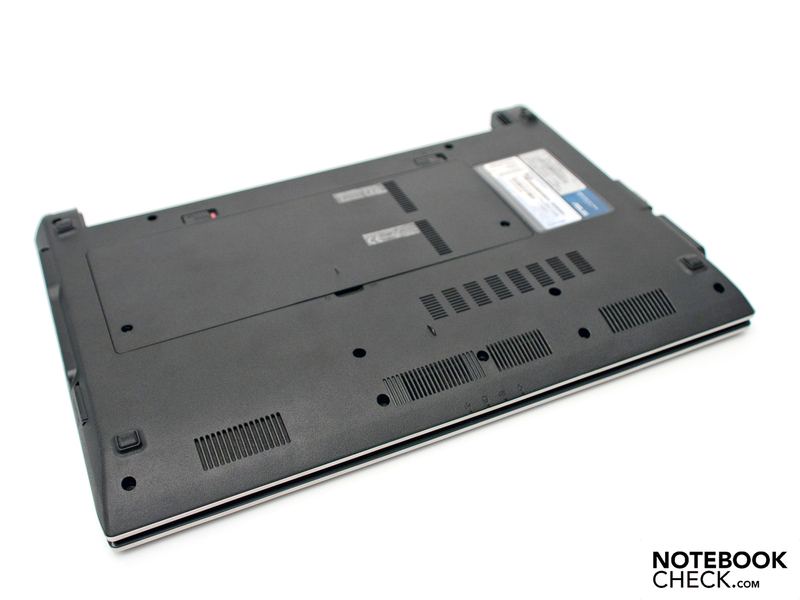 The U33JC is in a good midrange for multimedia notebooks with 5363 points in PCMark Vantage. Cinebench R10 supplies a comparable result with a maximum of 6278 points in multi-core rendering (32 bit). 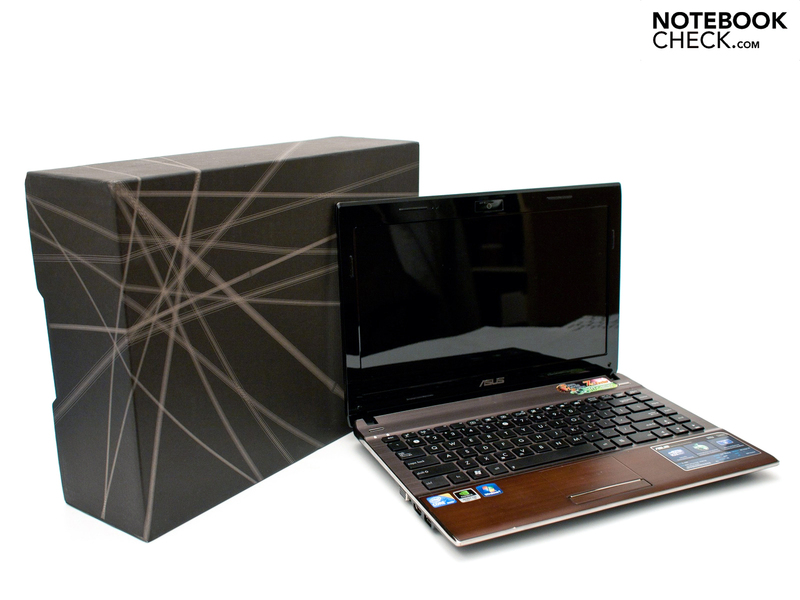 The Dell Vostro 3500 (Intel Core i5-430M, Nvidia GeForce 310M) and the somewhat stronger Toshiba Satellite Pro L650-197 with an Intel Core i5-450M and ATI Mobility Radeon HD 5145 graphics unit are in its immediate vicinity. 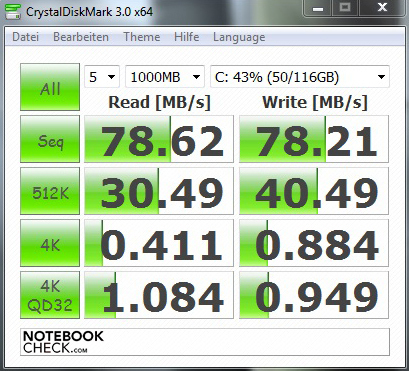 Futuremark's 3D benchmarks provide a good comparison basis. The latest 3DMark Vantage benchmark gives a weak result with 1032 points. That is in the lower third of multimedia notebooks. 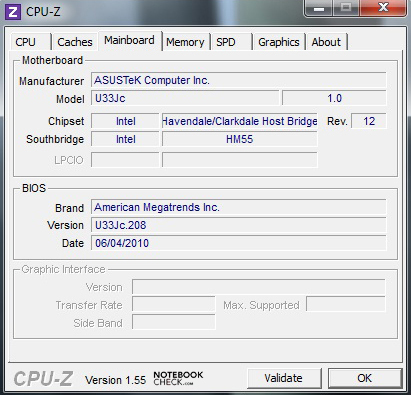 Comparable devices are found in the Asus UL50VF (Intel Core 2 Duo SU7300, Nvidia GeForce G 210M) and the HP ProBook 6540b with an Intel Core i5-430M and dedicated ATI Mobility Radeon HD 4550. 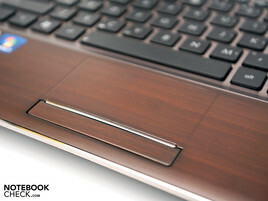 The bamboo notebook is only available with a 2.5 inch drive in Germany. It bids a gross capacity of 500 GB. 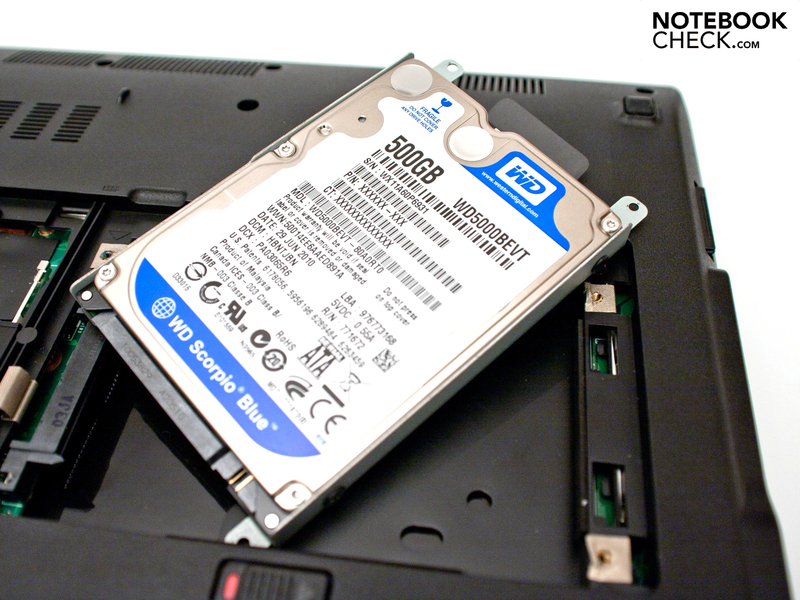 The Western Digital (WDC) Scorpio Blue with the model label (WD5000BEVT-80A0R) provides acceptable transfer rates for everyday use. It doesn't stand out from the broad mass with a maximum transfer rate of 82.4 MB per second (read) though. However, the unproblematic extendability has to be underlined positively. 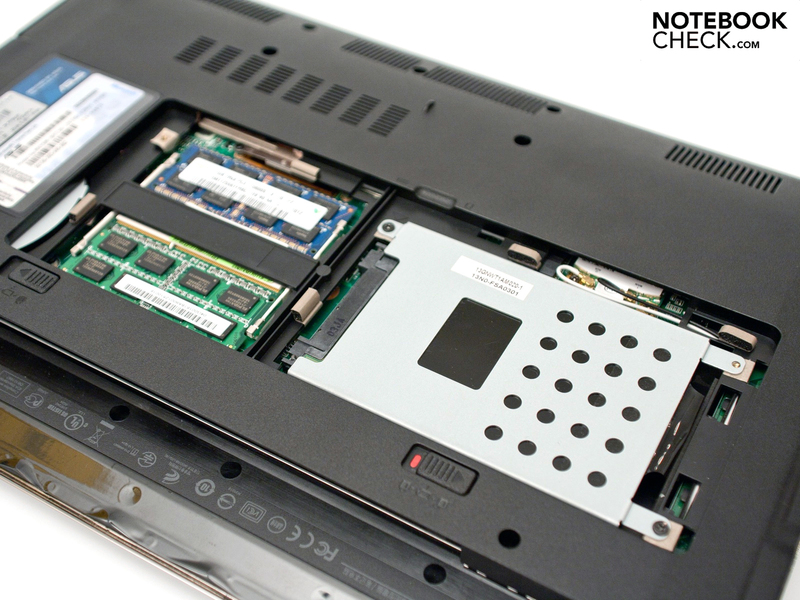 A fast drive or a solid state drive (SSD) can be installed within a few minutes. The Nvidia GeForce 310M is based on the somewhat older GeForce G 210M. The clock rates have hardly changed, though. It basically offers a weak gaming performance. Current DirectX 10 games can only be implemented with minimum to medium graphics settings. Complicated tracks, like GTA IV or Need for Speed Shift, don't run smoothly at all. Slightly older games with DirectX 9 support can generally be played smoothly. Ambitioned gamers who put value on good 3D performance should favor a stronger graphics unit. A dedicated graphics unit and a modern processor need good cooling and a strong fan. It provides a wide noise range, depending on demand. The U33JC performs very quietly in an ideal mode with the incorporated Intel GMA HD graphics unit and remains inconspicuous with a maximum of 31.0 dB(A). 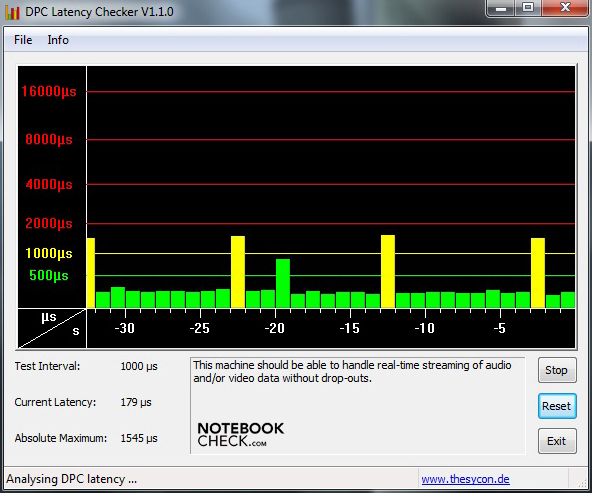 The soundscape looks different under load with an enabled Nvidia GeForce 310M. The device can't longer be overheard with a maximum rate of 50.2 dB(A) in the stress test. Another drawback is that the fan only turns down slowly to 30.6 to 35.0 dB(A). The cooling system does its work very efficiently. We measure a maximum of 34.8 degrees Celsius in the vent's area during normal use. The upper side stays within an acceptable range with a maximum of 31.0 degrees Celsius. You don't notice any disturbing temperatures in the usage area due to the bamboo and aluminum surfaces. The assessed rates only increase slightly under load. We notice an obvious selective heating on the bottom with a maximum of 45.2 degrees. However, it's not yet distressing. Asus advertises the U33JC with an "enormously high sound quality" due to SRS Premium Sound. Overall, the high pitches, as well as the volume, are convincing enough to fill a large room with sound. Nevertheless, deep pitches and basses lack substance. Thus, we can't verify the advertised great sound. The notebook bids a 3.5 millimeter jack for external headphones or speakers. 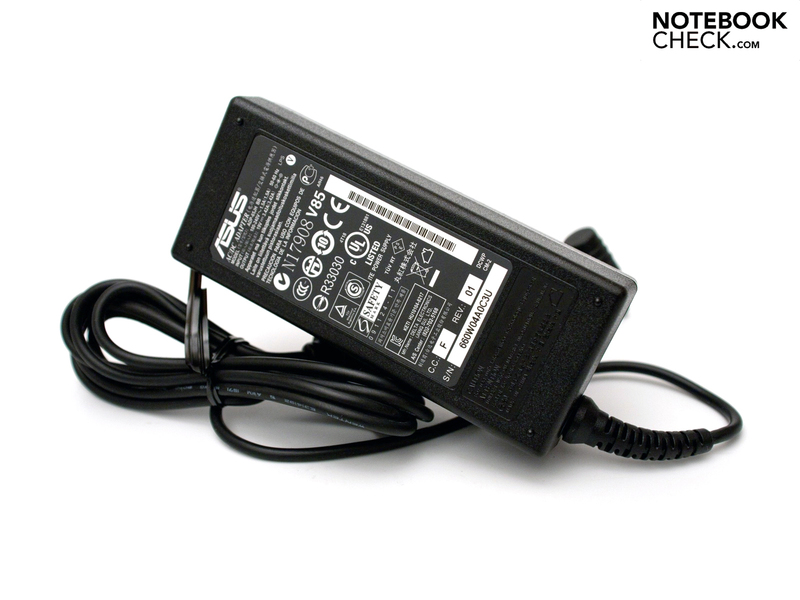 This port supplies a sufficient output level if good peripherals are used. The installed HDMI out additionally provide the possibility to supply an AV receiver or TV with audio and video. 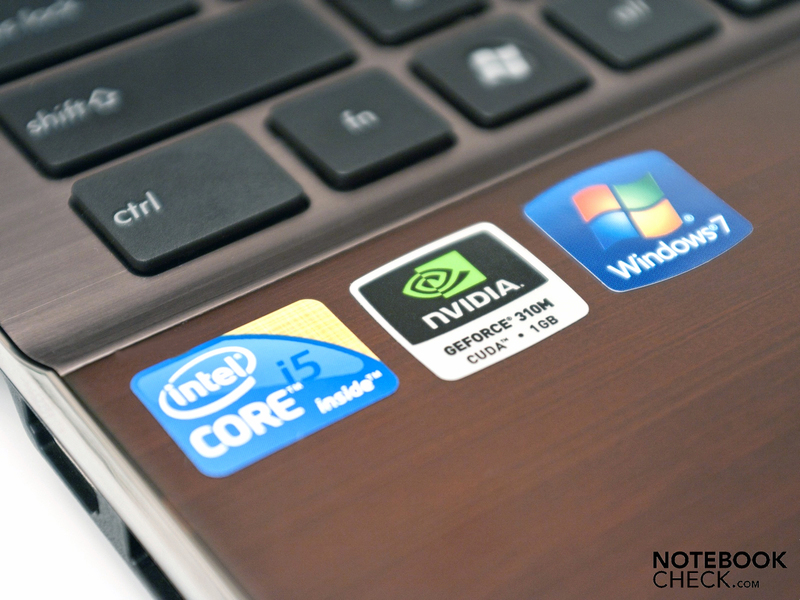 The Intel Core i5-430M's and the dedicated Nvidia GeForce 310M's power consumption is kept in limits. This is due to Nvidia's Optimus, which determines the application's graphics requirement and switches automatically. 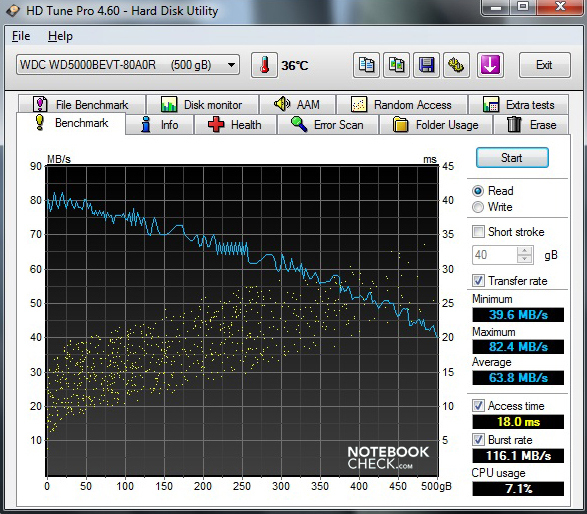 We looked at the power consumption of Intel's GMA HD with and without Super Hybrid Engine's support for one thing. For another, we looked at the consumption with an enabled 310M. 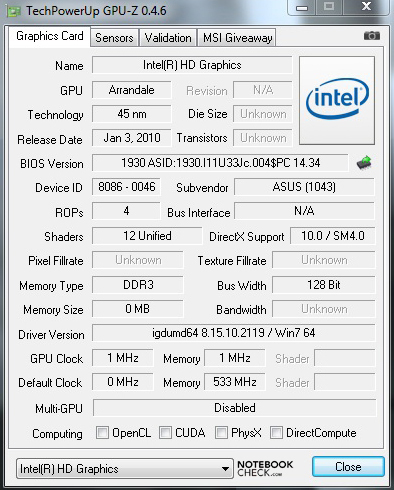 Intel's HD GMA is addressed in normal use. 8.6 to a maximum of 16.5 watts are consumed with enabled Super Hybrid Engine, which additionally decreases the consumption by reducing hardware performance. The dedicated Nvidia graphics unit is automatically activated under load and the power consumption rockets. 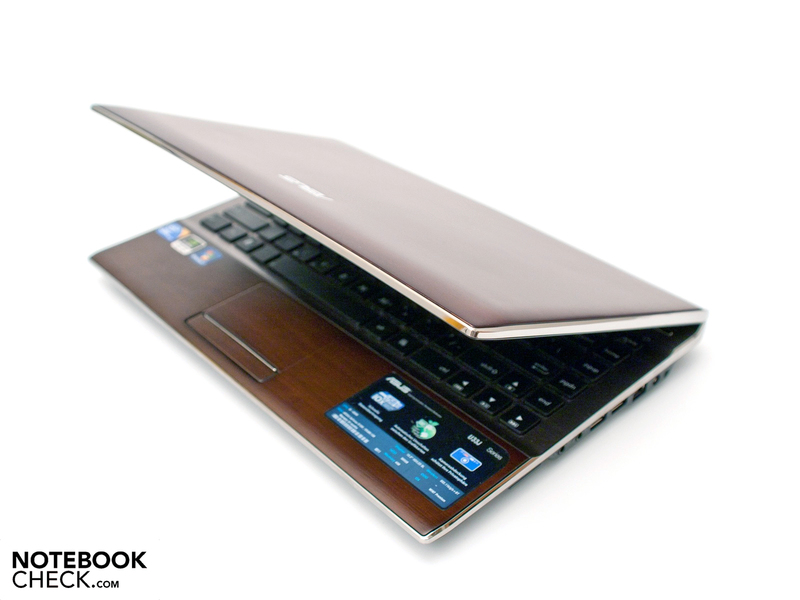 The maximum rate is then 71.5 watts, which is within the range of strong multimedia notebooks. Just like the power consumption, the battery runtimes vary evidently. A battery life of 10+ hours is indicated by Asus above the keyboard. The "Reader's Test" simulates the minimum hardware requirement with enabled Intel GMA HD graphics unit. 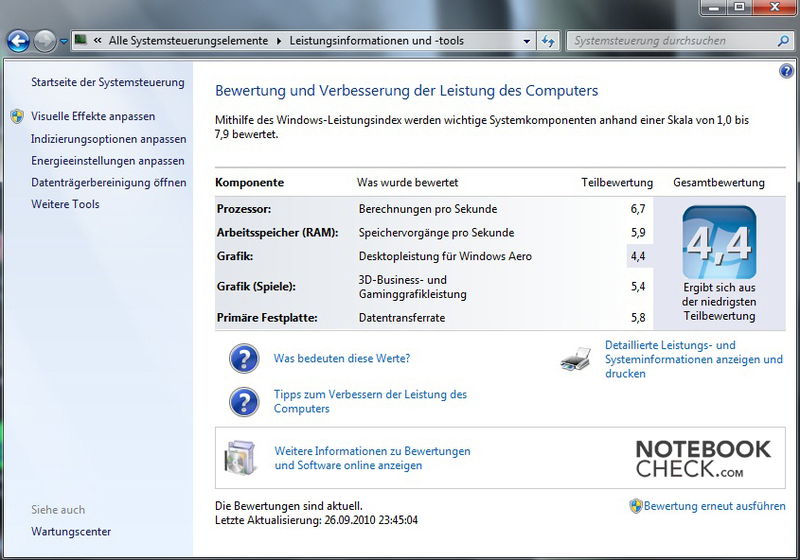 In this case, the display brightness is set to minimum, Windows 7's energy savings profile is enabled, Super Hybrid Engine is active and all mobile technologies disabled. 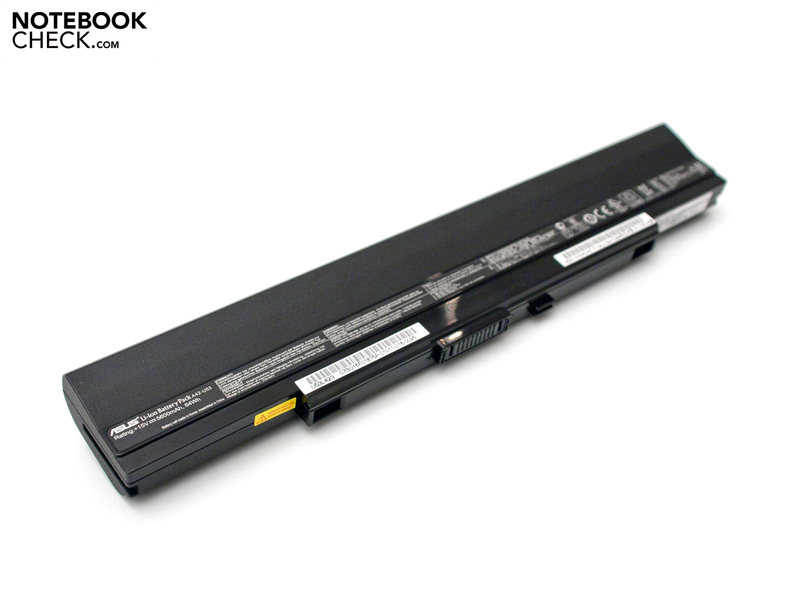 The 8 cell battery's capacity is drained after 8 hours and 44 minutes. Thus, the battery's runtime is still close enough to the advertised specification, but it will hardly be achieved in practical use. Nevertheless, there still is enough time to surf wirelessly on the web. With an enabled WLAN module and an acceptable brightness level, you have 6 hours and 19 minutes to surf on the internet and check emails. The runtime in load situations can be simulated with BatteryEater's "Classic Test". 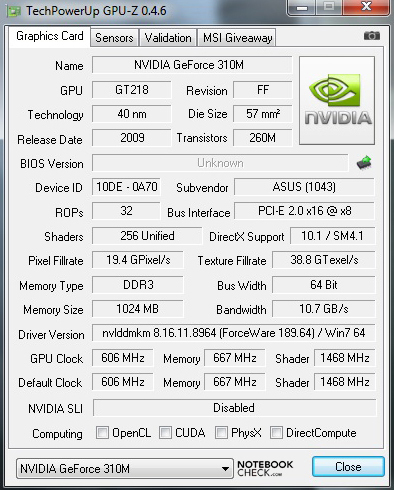 The stronger Nvidia GeForce 310M is enabled, the display's brightness is set to maximum and Windows' high performance mode is active for this. In this case, it has to go back to the mains after a short 87 minutes (1 hour and 27 minutes). 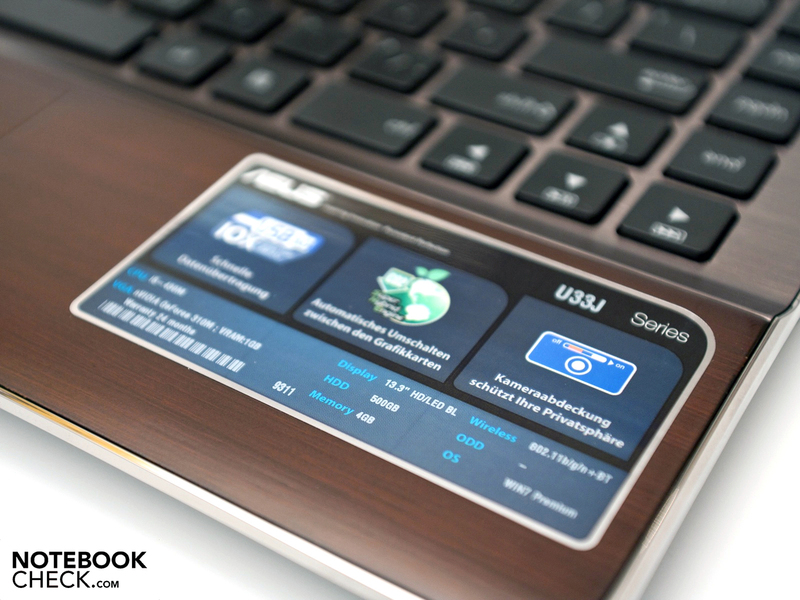 A very chic multimedia notebook is released onto the market with Asus' U33JC-RX044V. It impresses optically with bamboo and aluminum applications. The workmanship and choice of materials is successful. The connectivity is more than apt. USB 3.0 and HDMI are further advantages. The keyboard and touchpad are overall inconspicuous in regards to usability. 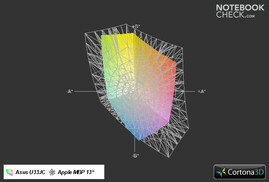 The 13.3 inch display with a high-gloss surface complies with the vast majority. However, it shows weaknesses when used outdoors. The hardware's performance is only convincing in the application performance field. It lacks a good 3D performance for games. Asus' heralded "SRS Premium Sound" is basically more an illusion than reality and only refers to the high pitches and volume. You'll wait for deep pitches and basses in vain. The battery life is good with a practical 6 to 7 hours. But the promised 10+ hours seem rather utopistic. Design fans will basically get a very elegant notebook with solid multimedia hardware for 999 euro (RRP). The Asus U33JC-RX044V is now available in Germany and Austria. 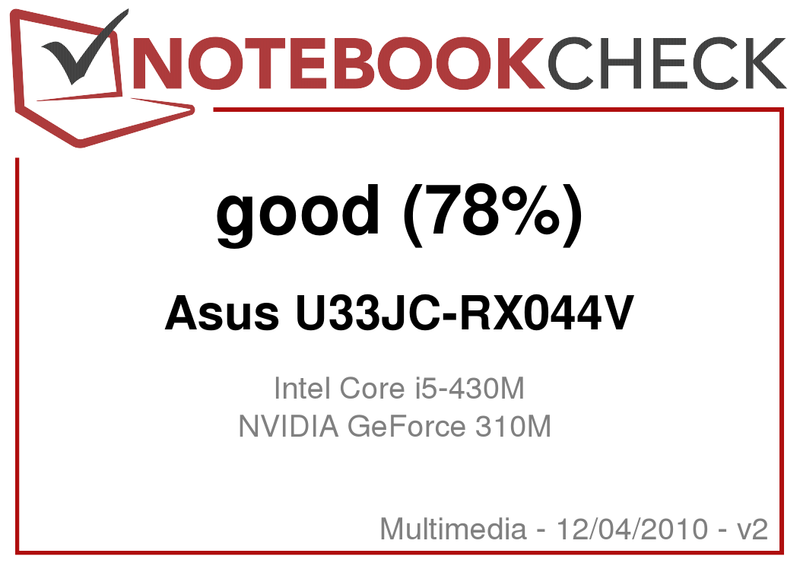 In Review: Asus U33JC-RX044V Notebook. The smallest notebook of the "Bamboo Collection" is named U33JC-RX044V. 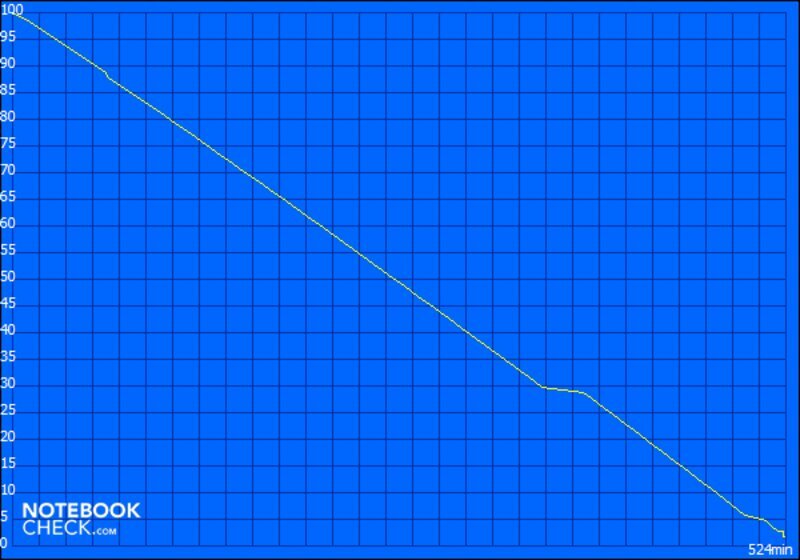 The glare type display only provides average rates. The camera cover is a common courtesy nowadays. The case's good workmanship is convincing. The bottom is clearly arranged and the big maintenance cover has advantages. Exchanging the RAM and hard disk is an ease. Asus is on a saving course and looks for the cheapest modules for the U33JC? The integrated hard disk provides good everyday performance. 10+ hours of runtime seem utopistic to us. The status LEDs are cleverly located below the touchpad. The display hinges provide a good grip with the usual teetering. 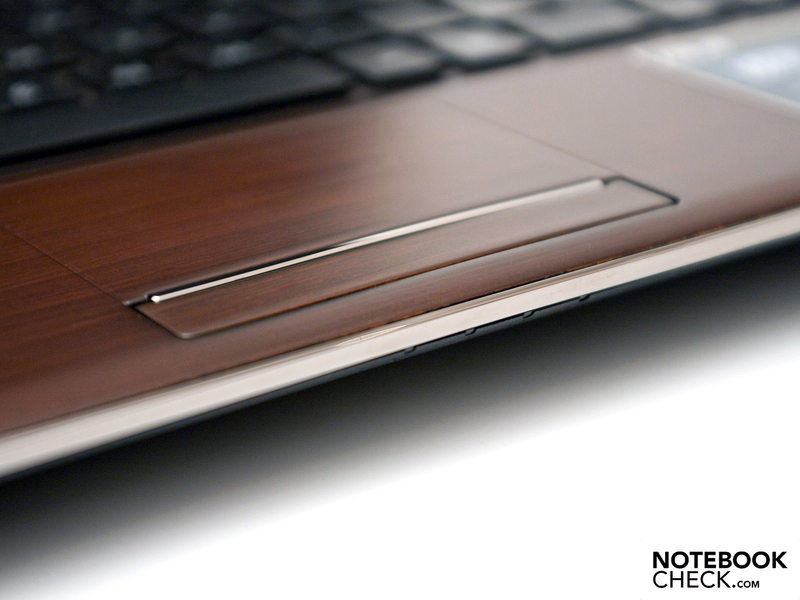 The case has nice applications of dark brown bamboo and brushed aluminum. The slim 13.3 inch device weighs 2.05 kilograms. The case border in chrome look additionally enhances the device. Good application performance: Intel's Core i5-450M and Nvidia's GeForce 310M. Unfortunately, the Nvidia Optimus' automatic switching doesn't work flawlessly. 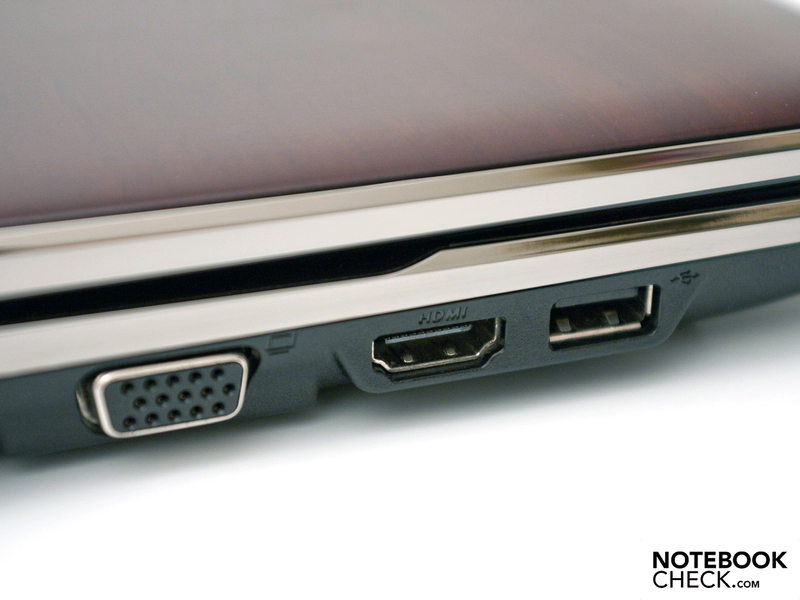 A modern HDMI port for high resolution material shouldn't be left out. 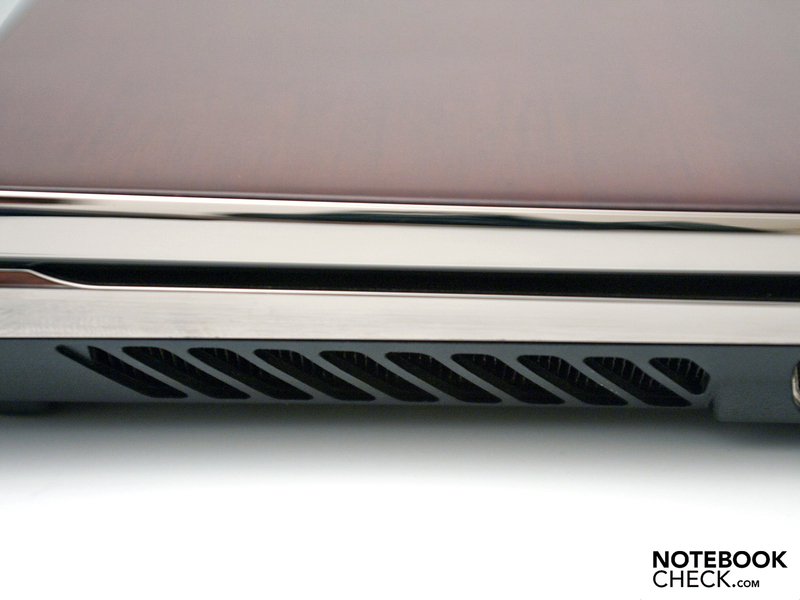 Despite large vents, air accumulates slightly in the case. 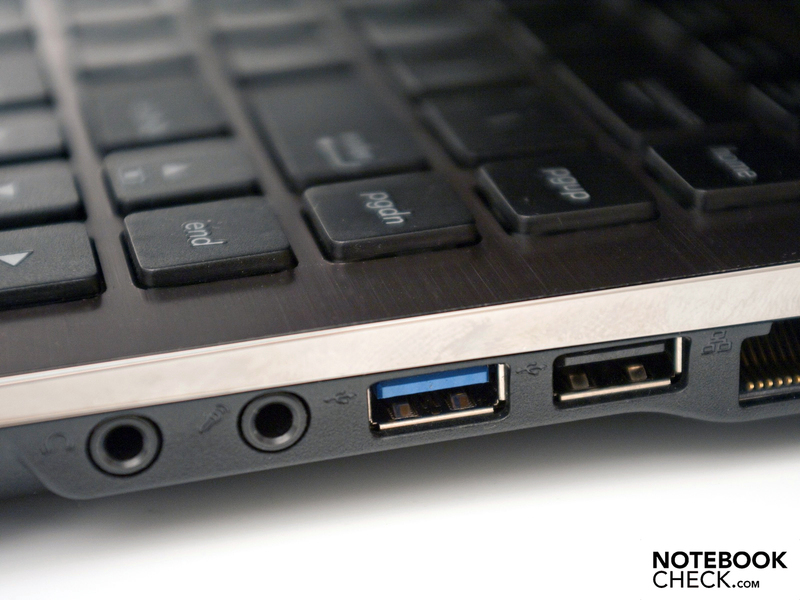 A special treat: a USB 3.0 port for fast peripherals. Agreeably, the adapter is very compact and light. 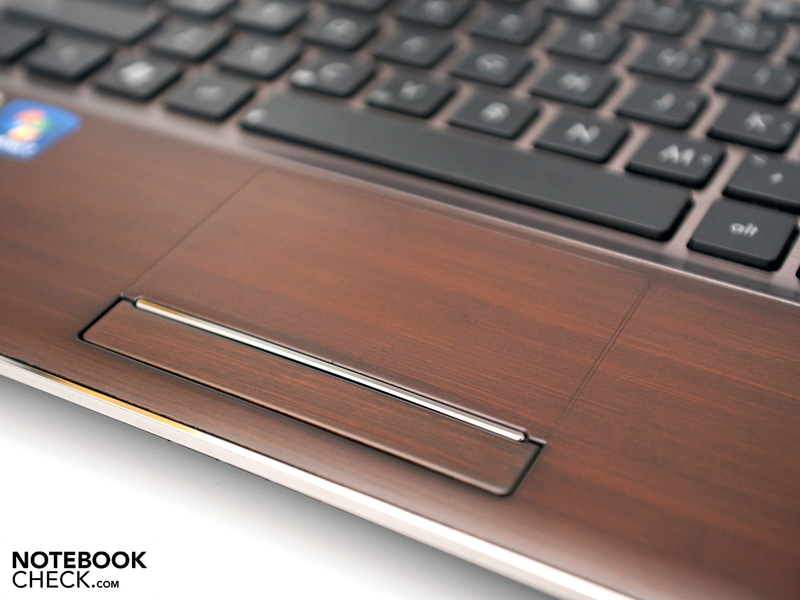 The elegant design and applied materials (bamboo and brushed aluminum), just like the latest USB 3.0 port. A matt display so that the U33 really lives up to its claim on mobility. How "eco" or "green" can a notebook really get? Is a packaging whose raw material once had leaves really enough for such a tag? 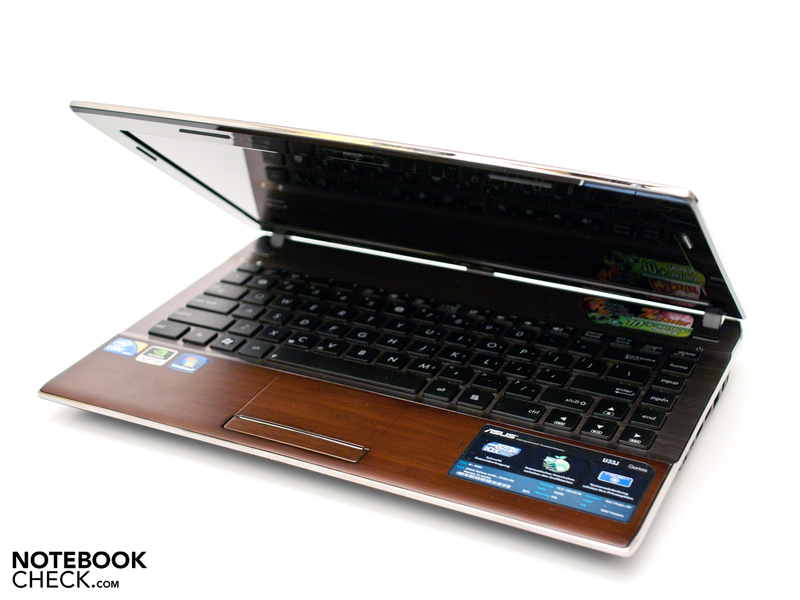 All multimedia notebooks with a 13.3 inch screen and the latest Intel processors. Amongst these, for example, Dell's Vostro 3300 with Intel's Core i5-450M and Intel's GMA graphics and HP's Pavilion dv3-2390eg with Intel's Core i5-450M and dedicated ATI Mobility Radeon HD 4550 graphics and touchscreen.